Christian counseling combines principles of psychology with Christian tenets based on the Bible. Christian counselors help people with their relationships and personal issues, but do so by using psychological therapies that are also in line with Christ’s teachings. Online Christian counseling degree programs provide a flexible and convenient educational atmosphere where students can obtain a behavioral science foundation within a religious context. This guide will help prospective students find the right online Christian counseling degree. Several colleges around the country offer Christian counseling programs in an online format, allowing students to pursue their goals of becoming a faith-based counselor without having a strict academic schedule. Christian counseling programs emphasize a combination of psychological practice and applying Christian tenets to best help advise members of the Christian community. There are several schools out there offering these online programs, so we’ve looked at data for each school regarding price, success rate, and student/teach ratio, and we’ve compiled a list of the best programs. 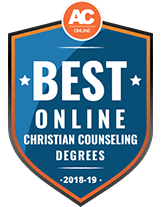 Look below to find the best online Christian counseling programs for 2018-19. Lee University's Division of Adult Learning (DAL) offers a bachelor's degree in ministry leadership. This program offers 8 different areas of emphasis, including 1 in counseling for those interested in a ministry counseling career or graduate studies in counseling. Online programs through DAL are available in fully online 7-week terms, or in a hybrid format, which consists of 7-week terms combined with 2-week on-campus intensives. Courses are delivered through Lee Online, using the Moodle platform, plus students participate in online meetings with instructors for lectures, group discussions and mentoring. Graduates of the ministry leadership program are required to earn 120 credit hours and maintain a GPA of at least 2.0 in major courses, which include 30 ministry leadership and 24 counseling concentration credit hours. For admission to Lee's DAL programs, students must have a GED or high school diploma along with 3 years of life experience beyond high school graduation, as programs are geared towards adult learners. In addition to Lee's regional accreditation, DAL programs are accredited by the Association of Christian Distance Education (ACCESS) and the Christian Adult Higher Education Association (CAHEA). At Johnson University's School of Congregational Ministry, students may earn a BA or BS degree in pastoral care and counseling. The BS degree is 100% online, and the BA is almost completely online (students must complete the language requirements for the BA on-campus at Johnson or through another institution). The curriculum combines biblical and arts and sciences core courses for a well-rounded approach, preparing students for counseling and leadership ministry roles. Sample courses include pastoral counseling, ministry counseling, family services, and conflict and communication. Students without transfer credits typically take 4 years to complete the program, taking 2 courses during 7-week terms. Those with transfer courses can shorten this time frame considerably and can transfer up to 90 credits towards the 120 credits required for graduation. Students can also plan to transfer credits through Tennessee Transfer Pathways, which provides smooth transfer of specific associate degrees from Tennessee community colleges to Johnson bachelor's degree programs. The Bachelor of Arts in Christian Counseling at World Mission University (WMU) is geared toward students interested in a career in counseling-related ministry, as well as to those planning to continue with graduate work. This is a fully online, 4-year program, consisting of 126 semester credit hours, with 45 being general education credit requirements and the remainder consisting of Bible, theology and major courses. WMU allows up to 84 approved transfer credits for this program, meaning only 42 credits need to be completed at WMU. Students can earn credits through a senior thesis project, and they must demonstrate Christian character and pass the Bible Comprehensive exam prior to graduation. Admission to WMU programs is open to Christians of all denominations, and is based on both academic and spiritual criteria, which includes active participation in church, a Christian ministry calling and baptism. Students will interview with the program director to determine if they meet all the requirements. For students interested in a career in ministry along with counseling, The King's University (TKU) offers a fully online bachelor's degree in biblical counseling. This is considered a pre-professional program, which prepares graduates to work in areas such as local churches, nonprofit service and freedom ministry, while also providing a solid foundation for graduate-level studies in counseling or Divinity. Students will complete 124 credit hours prior to graduation, with a majority of the curriculum being general education and major courses, along with electives, Christian Foundation courses and practicum/experiential learning. Courses are offered in accelerated 7-week or traditional 15-week formats, and depending on transferable credits, program length can vary. Students can transfer up to 90 credit hours earned from previous colleges and may also be able to earn credits for previous life experience or CLEP testing. TKU is accredited by both TRACS (Transnational Association of Christian Colleges and Schools) and ABHE (Association of Biblical Higher Education). For students interested in a career involving Christian-based counseling, Grace Christian University offers a Bachelor of Science in Human Services degree. The program blends general psychological principles, traditional counseling methods and biblical counseling components to prepare students to bring a Christian outlook and ethics to their work. While it is geared towards those planning to serve individuals or communities in areas such as education, corrections, social services, recreation and business, it can also be applied in other careers or serve as a foundation for graduate work. The accelerated bachelor's degree portion of the program takes about 24 months to complete and consists of 48 core and 12 concentration credits. Classes cover topics such as the theology of leadership, working with teams, survival psychology and biblical counseling. Students can transfer credits from other schools to meet the 120 total credits necessary for graduation. A capstone project is also required. Students interested in a career in Christian counseling can find several 100% online bachelor's programs at Southwestern Assemblies of God University (SAGU) to give them the background they need, including a counseling major that is a pre-professional degree, and a human services major with a counseling focus. For students planning to work in ministry and interested in counseling, SAGU offers an online bachelor's degree in child and family studies, which focuses on counseling, relationships and child development. While these are considered traditional degrees, all programs at SAGU integrate Christian faith with learning, and the curriculum is taught with a Christian worldview. In addition to typical college admissions requirements, students applying to SAGU must provide a Christian character reference along with demonstration of a born-again spiritual experience. Graduates from this program have found work in areas such as spiritual care, rehabilitation counseling, youth programs, social services, orphanages and in hospitals. Many also continue on to graduate school and earn licensure within the counseling field. Oral Roberts University is a Christian-centered institution based in Tulsa, Oklahoma, accredited by the Higher Learning Commission. It is open to people of all denominations and is committed to a "Whole Person Education" philosophy of improving the spirit, mind and body. Among its available programs, ministry and leadership is its most popular, and its theology programs are accredited by the Association of Theological Schools in the United States and Canada. ORU offers a 128-credit-hour, 4-year, online Bachelor of Science degree in Christian caregiving and counseling that combines psychology, crisis intervention, and assessment and evaluation with Christian caregiving courses such as developing helping skills or teaching the bible, to provide students with the skill sets needed to pursue careers in lay or pastoral counseling, or as community health workers or substance-abuse counselors. Each course term is 7 weeks long, and terms run year round so that students may complete their degrees earlier. A senior practicum paper is required in the final year. At John Wesley University, all undergraduate degrees are considered a double major ? each student completes their chosen major alongside a Bible/theology major. Students interested in an online Christian counseling degree can earn a BA in Christian ministry, with a concentration in counseling. The program includes internship and Christian community service requirements to prepare graduates to work as counselors in churches, camps, ministries and human service agencies, or to practice non-licensed Christian counseling for individuals, groups, couples and families. For those wanting to gain state licensing to become a counselor, this program serves as a solid foundation for the graduate studies required to do so. Students can complete the program in 4 years or less, depending on previous credits earned. There is no minimum credit hour requirement for transfer students, but a quarter of the 120 credits required for graduation must be earned at John Wesley. Students may also earn credits based on CLEP or DANTES testing, previous military and professional training and lifelong learning experiences. At Toccoa Falls College, students planning to work in areas such as ministry counseling, education and human services can earn a fully online bachelor's degree in counseling psychology, and can choose from minors in psychology, family studies or counseling. This degree also provides a stepping stone to graduate school for a professional counseling degree and licensure. The program typically takes 4 years but can be completed in fewer years with transferred credits. Students must earn 126 credits in order to graduate, and will also be required to participate in an internship along with research, service and outreach activities. Optional opportunities for involvement for online students includes intramural sports (if they live within a certain distance from the campus), student clubs, participation in the commencement ceremony, online videos of chapel services and opportunities for study abroad. Special tuition discounts are available for eligible full-time online students, such as for those living in certain counties, and a 50% tuition reduction for full-time emergency first responders. Johnson University in Florida is part of the Johnson University System and offers a variety of bachelor's degrees through Johnson University Online, including a BS or BA in pastoral care and counseling. This program prepares students to work in counseling and leadership roles within the ministry. It's considered a 100% online program; however, the BA degree does require an on-campus foreign language component. All students will participate in a professional internship prior to graduation, and must earn 120 credits for program completion. The program usually takes 4 years to complete, but with up to 90 allowable transfer credits, this time frame can be shortened considerably. For the 4-year plan, students take 2 courses per 7-week term, including over the summer. Courses are asynchronous, and delivered through Sakai, the college's Learning Management System (LMS) that serves as the online classroom and main hub for online students, and provides students access to assignments, video conferences, chat features, discussion forums and group projects. The Baptist College of Florida offers all coursework in a fully online format, including a program to earn a Bachelor of Arts in Psychology for those looking to pursue a career in Christian counseling. Applicants must submit a letter of recommendation from a church that they have been involved with for a minimum of 1 year, transcripts and ACT or SAT scores. They must also be able to demonstrate a strong sense of moral character. Upon admission, students participate in 120 credit hours of classes, which have to be completed with a minimum 2.5 GPA. Curriculum is taught through the web platform MyBCF and covers topics such as Christian doctrine, abnormal psychology, research design and personality theory. Online learners have access to the library and bookstore to assist in their studies. Following graduation, students are prepared to enter graduate and doctoral programs for counseling fields. Residents and non-residents pay the same discounted tuition rates for online programs. Students interested in Christian counseling and who already possess some college credit can complete their undergraduate studies by enrolling in Oklahoma Wesleyan University's online psychology program. The degree, which is rooted in biblical values, requires the fulfillment of 126 credit hours with a minimum 2.0 GPA. Degree-specific coursework must be taken through university offerings. Upon graduation, students will be equipped to work toward a higher degree. The Student Success Center is available to connect learners with a variety of services such as free peer tutoring and access to resume writing software. The school also engages online students by recording services and speakers at the Chapel at OKWU. If you are interested in applying, you will need to provide transcripts demonstrating a 3.0 grade point average. There are a number of school-funded financial aid and scholarship opportunities including awards granted to full-time missionaries, valedictorians and pastors. Active-duty members of the military receive a discounted tuition rate and fee waivers. OCUOnline Plus is a program developed by Ohio Christian University that provides students with opportunities to complete online undergraduate studies while engaging in additional credit-earning experiences. For example, those interested in Christian counseling can work toward earning a bachelor's degree in psychology and simultaneously study at the Saint Bible Institute in Italy. In order to be admitted you must hold a minimum 2.5 GPA, as well as an ACT score of 19+, SAT score of 980+ or CLT score of 50-54. For those who already possess a minimum of 50 college credits with a 2.0 grade point average, there is an accelerated online option for degree completion. Both pathways require a total of 120 credits in general education and field-specific coursework such as Abnormal Psychology and Spiritual Elements of Illness and Recovery. You must maintain a 2.0 GPA for credits to count toward graduation. The school prides itself on providing scholarship opportunities and military discounts, noting that 85% of students receive financial aid. The FLEXCampus at Dallas Christian University offers students a choice in how they prefer to attend courses each week. They can use live web conferencing to engage in real-time lectures, watch a recording of the class on their own schedule, or attend class on campus. These options are available for a number of degrees, including a Bachelor of Science in Psychology and Bible. The program, which equips students to continue on toward graduate studies in Christian counseling, calls for 129 credit hours. Curriculum explores cognition and emotion, the psychology of leadership and pastoral counseling. Students must receive a 2.0 cumulative GPA in order to graduate. Student Services are available to assist in reaching these requirements. Tutoring is available 7 days a week, counselors offer academic and personal guidance and mentoring programs provide spiritual encouragement. Prospective students will submit an application, a pastoral or church reference and an essay pinpointing spiritual and academic goals. Students interested in pursuing graduate studies in Christian counseling or teaching theology or working in ministry can enroll in Horizon University's bachelor's degree in biblical studies. Students in this program will complete 36 general education credits, 24 elective credits and 66 credits focused on the bible and ministry. A practicum field experience is also required in order to graduate. Curriculum explores counseling, church history, international missions and leadership. The school's online library is host to a number of resources as you work to satisfy a total of 126 credits with a minimum 2.0 GPA. This includes access to theological research databases, citation tools and writing assistance. The Chaplain engages the campus community by posting devotions on the My Horizon Activity Feed and is also available to provide students with individual counseling. Applicants submit transcripts and a 300-word writing sample describing their academic goals and spiritual journey. You will also participate in an interview. Graduates of Messenger College's online program to earn a Bachelor of Arts in Counseling are equipped to pursue a higher degree or enter the workforce as social work technicians, client advocates and pastoral counselors. Curriculum involves 129 credit hours in coursework such as Person and Work of the Holy Spirit and Practical Ministry Training. You must maintain a 2.0 GPA throughout coursework to complete this degree. However, students intending to continue on to graduate school are encouraged to maintain a 3.0 average. Your application must include ACT or SAT scores, transcripts demonstrating a 2.0 GPA, 2 references and an admissions essay. The college works to engage online learners by posting recordings of chapel services and providing a link to submit prayer requests. You can also access a number of resources and tutorials through the virtual library. In-state and out-of-state enrollees pay the same tuition rates and there are a number of school-sponsored scholarships to help cut down on costs. Charlotte Christian College and Theological Seminary provides a Christ-centered education that is committed to high quality academics, the building of strong interpersonal skills and rooting the curriculum within a moral constitution. For students interested in Christian counseling, the college offers the online Bachelor of Arts in Urban Christian Ministries Concentration in Counseling. The entire program requires the completion of 128 credit hours. The major requirements (36 hours) include courses such as Christian Messages and the World Religions, Personal Evangelism, Demography and The Urban Church. The concentration requirements (30 hours) includes courses such as Basic Pastoral Counseling, Abnormal Psychology, Addiction Issues and The Christian and Sexuality. The program helps bring the practical aspects of counseling in an urban environment, including patient interaction and diagnosis, into a Christian context. Graduates will be prepared to serve as counselors within a religious and ministerial context. Trinity College of Florida offers a unique degree completion program called TrinityQuest that can be completed either through evening courses or completely online. TrinityQuest is specifically designed for busy working adults who have already achieved part of their degree and wish to complete a major of courses related Christian counseling at a flexible pace. For those students, Trinity offers the Bachelor of Science in Counseling Psychology program, where students will gain a foundation in counseling and psychology theory, develop strong professional counseling skills, and understand and weigh research and evidence while integrating Christian values into their discipline. Graduates of the bachelor's degree must achieve a total of 123 semester hours; however, the TrinityQuest program requires 54 of those semester hours to be in counseling and psychology coursework. Courses include Introduction to Counseling, Christian Theology, Cognitive Psychology and Psychopathology. All students must participate in a counseling psychology internship to graduate. Bethel College has a mission to help men and women who are called to ministry to pursue further learning in a specific area related to their Christian faith. For students interested in counseling, Bethel offers the online Bachelor of Science in Church Ministries Christian Counseling Concentration. This program is designed specifically to prepare students for advanced studies in Christian counseling or pastoral care. While this program provides practical opportunities to develop counseling skills, it is non-clinical and doesn't meet counseling licensure requirements. To graduate, student must achieve 130 credit hours, 26 of which are Biblical Studies courses, such as Old Testament Survey, New Testament Survey and Principles of Bible Study; 6 are Theological Studies credits, such as Theology I & II; and 62 hours are Professional Studies courses, such as Developmental Psychology, Issues of Christian Counseling, Psychology of Personality and Christian Counseling for Women. The program requires 2 semesters of a practicum and 1 semester of a ministry internship to put Christian counseling skills into practice. Arlington Baptist College's Biblical Counseling Online Program is rooted in the idea that changing the heart is the key to changing behavior and outlook through counseling. The online program follows the same degree plan as the on-campus program, but it is offered in a flexible distance education format. To graduate, students must complete 130 credit hours of coursework. The course plan is fairly prescriptive, with a 4-year map of programming for full-time students that integrates all of the general credits and major credits cohesively throughout the program. For example, first-year students complete 30 credit hours in coursework such as Biblical Worldview, Christian Service and Introduction to Biblical Counseling. Second-year students complete 38 credit hours in courses such as Bible Doctrine, Theological Basis of Counseling and Personal Life/Evangelism. Third-year students complete 37 credit hours in areas such as Biblical Conflict Resolution, The Acts of the Apostles and Biblical Languages (these credits include summer coursework between the sophomore and junior year and between junior and senior year). Finally, students in their fourth year complete 25 credits in courses such as Marriage and Family Counseling, Cross Cultural Ministry and Group Discipleship. Throughout the program, students complete a Christian Service credit each semester that integrates a practical element of service. Students also must complete a practicum in their final semester. Those who choose to earn their degree in Christian counseling have many exciting possibilities ahead. The following is just one example of the educational and career path of a person with an online Christian counseling degree. Getting a degree online provides convenience and flexibility for students who have other responsibilities, such as commitments to family and work. 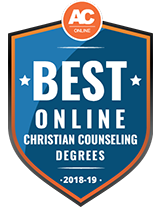 Online Christian counseling degree programs allow students to receive an education that is tailored to fit around their already busy personal and professional lives. Students can often take classes on their schedule, whether it’s after the kids have been put to bed or during their lunch break. Distance learning is also advantageous in that students don’t have to move to the school or commute to class several times a week, thus saving time and money. None of this convenience compromises the quality of the education. Students should still have access to the same faculty and academic support services as their on-campus counterparts. Of course, online students will need to have certain resources and technologies in order to take classes online. A broadband connection, real-time conferencing software and Web-based learning tools are necessary but easily obtainable. Depending on the school, students may be required to attend some elements in person. For most online Christian counseling degrees, a supervised practicum or internship is mandatory. Some schools may also require an on-campus intensive course or seminar where students will receive face-to-face instruction from their professors. Earning an associate degree on its own is not sufficient to become a state-licensed Christian counselor. However, an associate degree does provide a great foundation for educational advancement to the bachelor’s degree. For those who are already ordained, full licensure may not be essential, but the extra instruction and training obtained during the associate degree pursuit is useful for anyone providing Christian or pastoral counseling. To apply, prospective students usually need a high school diploma or GED. Once enrolled, they can get an associate degree in about two years by taking approximately 60 credits. About one-third to one-half of the credits may be in general education and elective courses such as writing and math. The remaining curriculum will be related to Christian counseling and religious-based instruction, with course titles such as Introduction to Christian Counseling, The Old Testament and Christian Education. Students may also complete a counseling Internship. As with the associate degree, a bachelor’s degree won’t be enough for those who would like to become state-licensed Christian counselors. However, it can serve as the stepping stone to a master’s degree, which is usually the minimum educational credential for licensure as a secular counselor. If a student doesn’t intend to seek state licensure but wants more instruction and training in counseling methods and theories, a bachelor’s degree is a fantastic option, as it will cover the same general topics as the associate degree in Christian counseling while going into more depth. Because of this, the bachelor’s degree takes about twice as long as the associate degree, consisting of about 120 to 130 credits and taking four years to complete. To enroll in a bachelor’s degree program, students usually need a high school diploma or GED. Some programs require an associate degree for entry. If licensure and/or private practice is the goal, a master’s degree is required by all states. Most programs last between two and three years and consist of about 40 to 60 credits. There are generally two types of Christian counseling master’s degree programs. The first are accredited and meet the academic requirements for licensure. These are typically 60 or so credits long and may take up to three years to complete. Additionally, almost all such programs require several hundred hours of supervised and documented clinical counseling experience. Upon graduation, students are prepared to become licensed counselors. A bachelor’s degree is usually required to be admitted into these programs. The second type of master’s degree program in Christian counseling generally does not meet the academic requirements for state licensure. These programs often require fewer credits for graduation and do not have the supervised and documented internship/practicum requirement. However, some have a thesis requirement as part of the master’s degree curriculum. For those interested in eventually becoming supervisors, researchers or professors, a doctorate degree is highly recommended. There are several types of doctorate degrees available. Some of the most common online doctorate degrees in Christian counseling are the Doctor of Philosophy (PhD), Doctor of Christian Counseling (DCC), Doctor of Ministry (DMin) and Doctor of Theology (ThD). For those who would like to teach, a PhD or ThD is probably best. For those who would like to focus on the ministry but still be able to provide counseling services when needed, a DMin might make the most sense. And for those who want to focus primarily on Christian counseling, a DCC would probably be suitable. In order to attend a doctorate program, most schools require a master’s degree in counseling, divinity or another religious or counseling field. Students can expect to take 40 to 60 credits and complete a dissertation or thesis; some schools also have a practicum requirement. The time it takes to complete the degree varies tremendously among programs, although two to four years is considered the norm. Coursework is dependent upon the type of doctoral degree one is seeking but may include classes such as Advanced Christian Counseling, Pastoral Counseling Methods, Communicating with God, Dealing with Addictions, and Research Methods. Online certificates in Christian counseling can be found at both the graduate and undergraduate level. Certificate programs are generally designed for students who desire additional training and instruction in Christian counseling methods and skills, but do not need another degree or state licensure. Unless the certificate is at the graduate level, there usually isn’t an underlying degree or educational requirement for enrollment. Graduate certificate programs, however, may require applicants to have an undergraduate degree or background in religious or counseling studies in order to be accepted. Typical certificate program coursework consists of about 15 credits and includes classes such as Family Counseling, The Scripture and Counseling, and Spiritual Care. The curriculum provides a broad foundation of counseling methods within a Christian values framework. Premarital and marital counseling techniques are examined in this class. Students will learn these principles and techniques using a biblical framework. The typical problems and issues faced by those in need, as well as common methods to help them, are at the heart of this course, which teaches counseling theories congruent with the Bible. This class introduces the fundamental principles of how drugs affect the human brain and how to utilize these principles when prescribing drugs in a clinical setting. Students acquire several hundred hours of experience in providing counseling services to others. Practicums are supervised at approved clinical locations, as well as in classrooms. The class teaches students how to provide the Christian-based counseling process by combining emotional and mental help with biblical and Christian ideals. Do you want to become a state licensed counselor? If so, many online programs will not meet requirements. Can you afford the tuition and related school costs, especially if students are not eligible for federal financial aid? Does the school offer any of its own financial aid, tuition assistance or scholarships? Is the school accredited? If so, is it accredited by an organization recognized by the U.S. Department of Education and the Council for Higher Education Accreditation (CHEA)? What is the religious philosophy of the Christian counseling program? Do their ideals align with yours? Some cover a broad swath of Christians, while others are aligned with a particular denomination. What do admissions counselors and former students have to say about the learning experience? How quickly can the degree or certificate be earned? Accreditation of a Christian counseling program may or may not be important to a prospective student, depending on his or her end goals. For those who intend to rely on federal financial aid or obtain state licensure, programmatic accreditation by the Council for Accreditation of Counseling and Related Educational Program (CACREP) and institutional accreditation by a regional organization recognized by CHEA is imperative in many states. If, however, a simple expansion of Christian counseling knowledge is all that is desired, then accreditation may not be as important. The Association for Biblical Higher Education accredits schools all over North America from multiple denominations. The Transnational Association of Christian Colleges and Schools accredits colleges rather than individual programs. It evaluates schools all over the world. The Commission on Accrediting of the Association of Theological Schools accredits both schools and programs in the United States and Canada. There are also religious accreditors not recognized by CHEA or the U.S. Department of Education that accredit online Christian counseling programs. Students who attend these schools are ineligible for federal financial aid. Students need a master’s degree before they can obtain a state counseling license. While there is no set path students should take to get the master’s degree, the following chart provides one possible route. The steps can easily vary should a student decide to become ordained or spend an extended period of time on a mission trip, for example. Graduates of a Christian counseling program are not confined to any one type of counseling. The below list provides an idea of what other jobs and careers might be possible. Provides counseling services within a religious framework with the goal of improving the individual’s psychological and religious well-being as a whole. Assists people suffering from substance abuse, addictions and their associated problems. Helps individuals with mental health issues to identify problems and find ways to deal with them. Aids spouses and family members as they deal with marital or familial discord. Works with students to help them grow and reach their full academic and personal potential. Many who obtain an online Christian counseling degree do not seek state licensure or certification. However, for those who have the professional goal of becoming state licensed, they must take care to attend the right online Christian counseling program so they meet certain requirements. Since each state has its own licensing requirements, students should check with their respective state’s licensing organization. Students can find links to this information by visiting the American Counseling Association’s website. Generally speaking, most states require at least a master’s degree from an accredited institution, supervised counseling experience, and passage of the National Counselor Examination for Licensure and Certification (NCE) and/or the National Clinical Mental Health Counseling Examination (NCMHCE). Besides secular licensure, there are opportunities for private, Christian licensure. One such possibility is offered by the National Christian Counselors Association (NCCA). The NCCA is a nonprofit organization that ensures Christian counselors, ministers, medical doctors and other professionals utilize methods that most effectively maintain Christian principles when counseling others. Christian counseling may not be for everyone. That doesn’t mean the opportunity to counsel, heal and help others is no longer available. There are similar online programs available for those who want to enter the counseling world. Most commonly found at the master’s degree or graduate certificate level, an online addiction counseling program prepares students to become licensed and certified addiction counselors. Online mental health counseling programs are very popular at the master’s level, which is usually the minimum education required to become a mental health counselor. By going into this profession, counselors can diagnose and treat mental health disorders. School counselors help students succeed in school. To serve in this role, school counselors must receive special training and education covering working with younger learners.